Amish donuts: these cinnamon caramel donuts are a taste of my trip to Amish country in northern Indiana. Cinnamon caramel Amish donuts are best donuts I’ve ever had in my LIFE. This is probably the fastest I’ve gone from having something delicious at a restaurant and coming home to re-create it. Last weekend, we took our kid to Amish Country in super far north in Indiana/ southern Michigan. I’ve always had a soft spot for their lifestyle, and I wanted to teach my kid that it’s okay to live however you want to live in our free country. Plus, Amish food is some of my favorite food (chicken and noodles for LIFE, I tell ya). After a ride in a horse and buggy from a sweet little old man, a tour of the gardens (and approximately one million questions from Camille about whyyy the pumpkins are still green and when will they be orange already?! ), we sat down for lunch. Camille had her first bite of fried chicken, and kept going back for more. Then, she was finally convinced that mashed potatoes are worth eating. (Normally, she avoids white and brown foods for whatever reason, I cannot tell you). Just when I thought I had done my job as a parent to teach my kid about the world, we walked past the homemade candy. Suffice it to say: all she knows and remembers about Amish Country is sugar. Sugarrrrrr. But all I can remember is these Cinnamon Caramel Amish Donuts. We stopped at Rise N Roll in Nappanee for a dozen of what the locals call ‘Amish crack.’ I’m not entirely sure how offensive that phrase is, so I’ll only repeat it once. 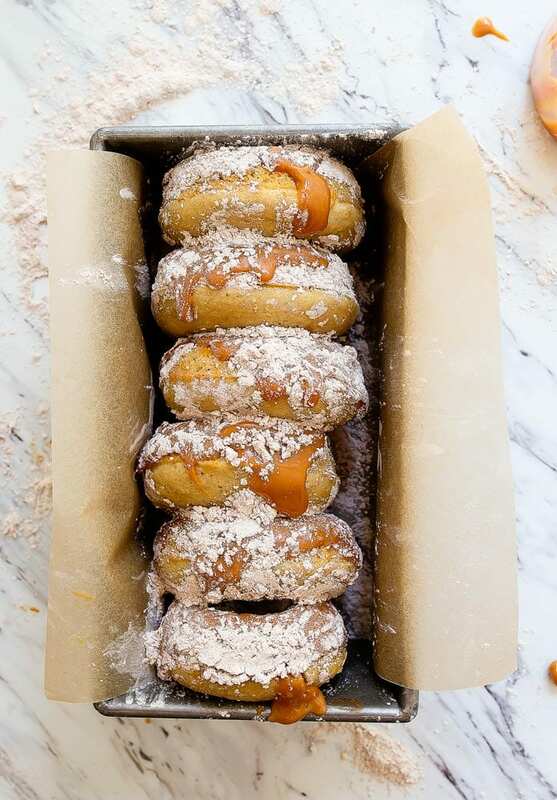 ‘Amish crack’ is a yeast-raised donut, fried, dipped in caramel, and sprinkled (heavily) with cinnamon-powdered sugar. It is the single best donut I’ve ever eaten in my life. And I wasn’t even hungry. I had a Perfect Bar for breakfast and had stolen many sips of my husband’s coconut milk macchiato a few minutes prior. I cut a donut in half, just to try it. I quickly ate it, the other half, and another one after that. Dang. I assumed the donuts had sour cream in them, because they have a cooling effect when you bite into them. I heard from a trusted source that they do not contain sour cream, so I’m assuming it’s the cornstarch in the powdered sugar that makes them cool and melty in your mouth. Regardless, I grabbed the best recipe on the internet for baked donuts (it’s Joy the Baker’s browned butter baked donuts, you knew that! ), made a caramel glaze, and a little cinnamon powdered sugar bath. And again, I ate two right after making them. If you’ve ever had Amish donuts in your life, you’ll know they’re some of the lightest and fluffiest delights ever. I can’t believe this recipe is baked, because they taste just like a real fried Amish donut! It’s perfection. You just have to try them to believe me! 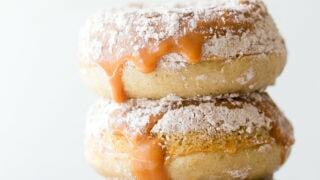 Small batch Amish donuts: cinnamon caramel donuts. First, in a small saucepan, add the butter and turn the heat to medium. It will begin to crackle and pop as it melts. Keep an eye on it. When the popping noises start to slow down, tilt the pan to gently swirl the butter. Keep an eye on it very closely, but keep cooking it until it smells nutty and brown bits appear in the butter. We only need 2 tablespoons of butter for the recipe, so measure out 2 tablespoons and use the small remaining amount for something else. Next, preheat the oven to 350, and grease a donut pan with 6 spaces very well with oil. In a medium bowl, whisk together the flour, baking powder, baking soda, salt, nutmeg, and sugar. In a small dish, stir together the egg, buttermilk, vanilla, and 2 tablespoons of the browned butter. Add the wet ingredients to the dry, and stir until well-blended, but do not over-mix. Divide the batter between the spaces on the donut pan, and bake for 8-10 minutes. The donuts will feel springy and a toothpick inserted will come out clean. Let the donuts cool in the pan for a few minutes before removing them. Meanwhile, melt the caramel bits with 1 tablespoon of water in the microwave for about 25 seconds. Stop, stir and heat for 15 seconds, or until totally smooth and melted. Stir in the cream to thin out the caramel (oh, the irony!). 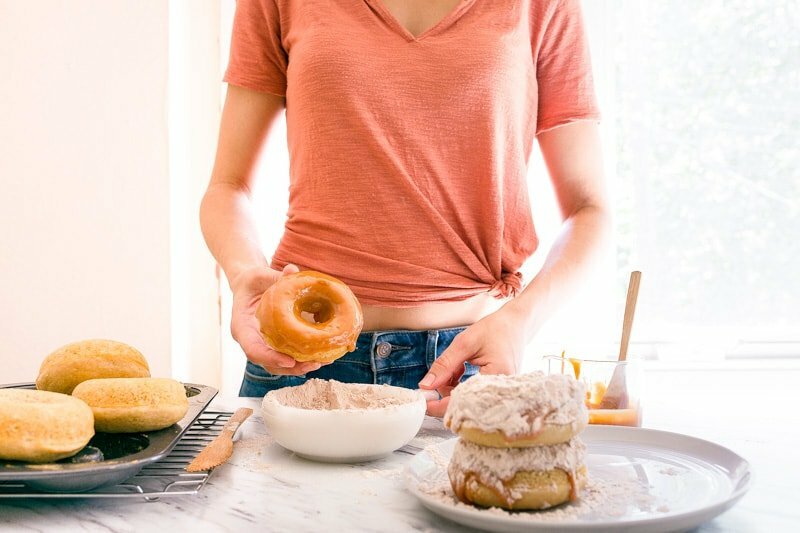 Using a wooden utensil, run it around the edge of each donut in the pan, and pop each doughnut out onto a wire cooling rack. Whisk together the cinnamon and powdered sugar into a shallow bowl, and set aside. 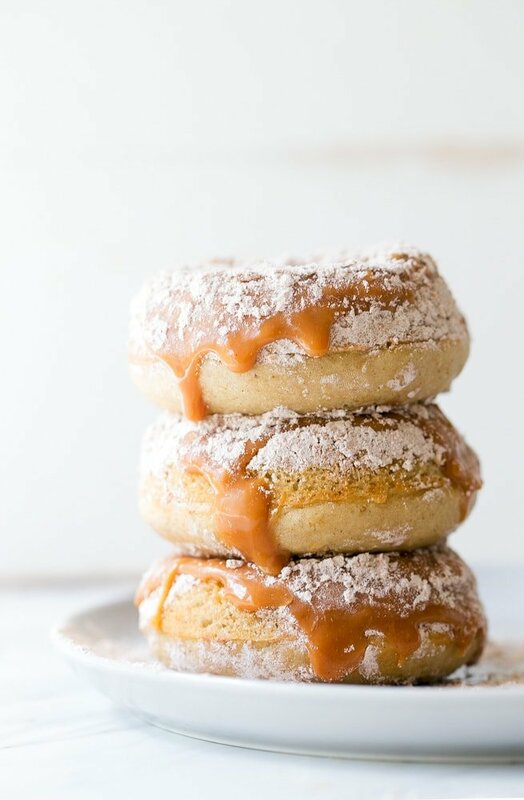 Dunk each doughnut in the caramel glaze, followed by the cinnamon-powdered sugar. Sprinkle more cinnamon-powdered sugar on top before serving. Trips to the Amish doughnut stand at our local farmers market is my #1 reason for going to the market. Fried fresh right in front of you, dipped and flipped in cinnamon sugar and passed over in a paper bag. Does it even get any better? (they also have apple fritters – which are actually apple rings caked in doughnut batter, fried and dusted in cinnamon sugar – and I love them more than there are superlatives for love) #2 is super cheap bouquets at the next stand from the sweetest family. just reading through the recipe and pictures, i know i want at least 3 of these with my coffee. weekend project and i cant wait. ah I love Amish food too!! These doughnuts look unreeeeeeal! I just had to check out your recipe when I saw it come through on my FB feed. We have an Amish shop in our town that brings in donuts and baked goods during the week from a town in northern IN (it’s all very secretive and they won’t tell us from where) . Now that I’ve seen Rise ‘n Roll’s website, it has to be from them! You are right. I had my first one just over a year ago, and they are the best donuts I’ve ever eaten. EVER. The extra 15 lbs I gained this past year from eating donuts will attest to that! 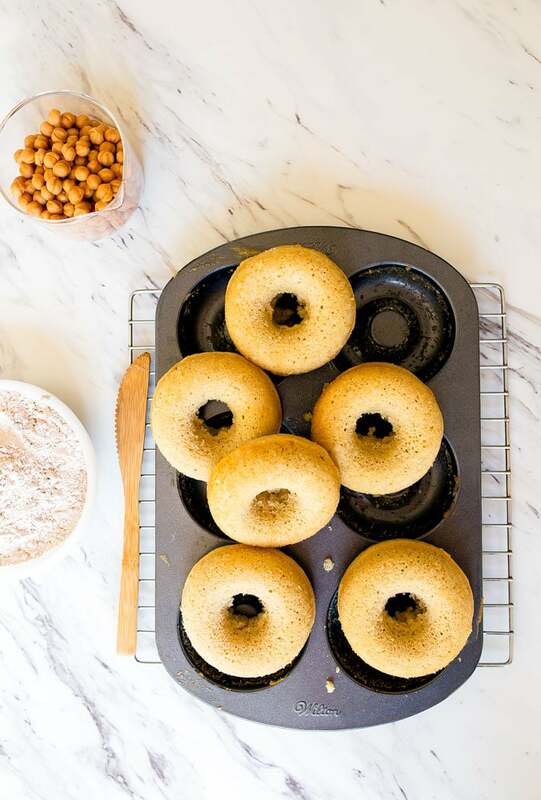 I don’t (currently) own a donut pan–is there another way to bake these that would still taste delicious, even though they wouldn’t be donuts anymore at that point? Hmmm…Brianna. I would try a regular-size muffin pan. these donuts look like real “gustostueckerln” as the austrians would say. roughly translated: little pieces of something outrageously delicious. having tried several of your recipes and ending up giving them a permanent place in my recipe collection i’d like to tell you that your research and work in scaling down the sweeter things of life is so very much appreciated! the fact that you make everything look so very appetizing and prettyprettypretty doesn’t hurt either! so: thanks!! regarding these little morsels: what are “caramel bits”, please? and, in case it is a specific type of candy could you recommend a substitution? austrians are not big on “ethnic food” (even he**z ketchup is not widely available!) or convenience products. lots of love from austria! We served these at my daughter wedding last year! OH MY GOSH!!!! Drooling!!!! Can’t wait to try these!! 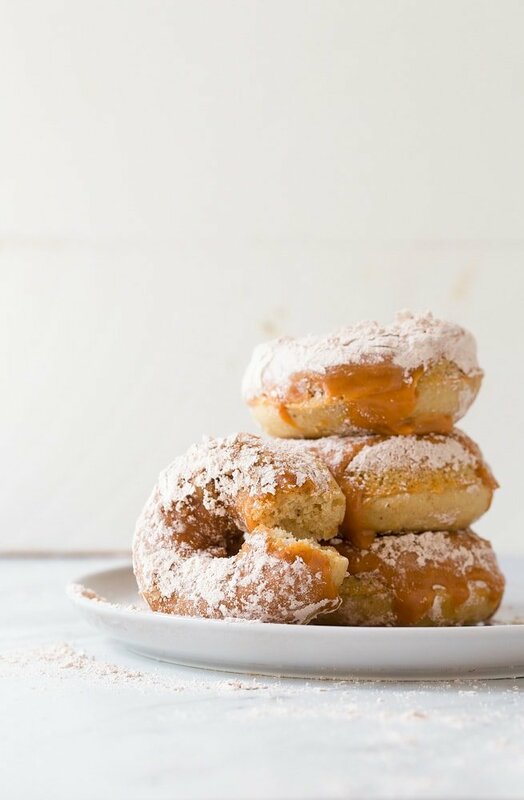 PS- someday will you tackle a small batch yeasted/fried donut recipe for us pleaseeeee?? Thanks!!!!! …and I hope your house sale/move is working out!! Mmmmmm……..???? I can’t wait to try these! ???? I relocated from Pittsburgh, PA to Lancaster County 13 years ago. A lot of my neighbors and friends are Amish or come from an Amish heritage. Lots of good eats out here! I don’t have a donut pan. Will it work to make donut holes on a sheet pan instead? I don’t think so, I’m sorry! Where does one buy “Carmel Bits” in the USA? .. and .. if I bake them in my mini donut pan, will the baking time be the same? Thank you. I think this question was already answered in the comments…lemme check. Everywhere I look for buttermilk it’s never all buttermilk, it’s always either 1% or 2%. Can I use them in the recipe? Yes, either is fine. 2% is richer, so it’s what I would recommend. Do you let the donuts cool completely before glazing? Yes. Sorry, I just assumed they would cool during the time it took to make the glaze. I’m jealous you used to drive by Rise n Roll everyday! When you put serving size as 1, does that mean one donut or is that for the whole recipe of 6 donuts? Serving size is 1 donut; the nutritional info is for 1 donut. Multiply by 6 for total calories.